The Centurion was simultaneously the last of the cruiser type and the first main battle tank. It was one of the most influential design in history, the embodiment of Darwinian evolution in solid cast steel, summed up in a few years of bloody fighting. Compared to prewar designs, like the Cruiser I, the incredible technological acceleration that culminated in the Centurion says it all. At the very roots of this evolution was the Christie suspension, the British 17-pounder anti-tank gun and late the German tanks designs. Just like the Soviet IS-3 and American M26 Pershing, the Centurion came too late for World War Two, but right on time as a precursor of today’s main battle tanks. Fifty years after, the Centurion is still around, in many shapes and colors. The Centurion was born as the A41 Cruiser tank, under the pen of the Directorate of Tank Design. It followed precise specifications that tried to erase faulty past designs and enhance durability, reliability, protection and mobility. For firepower, the 17 pounder still seemed up to the task of dealing with German heavy armor. Protection minimal specs included the ability to resist a frontal direct hit of an 88 mm (3.46 in) shell or the blast of a mine. All was to be encompassed within a strict 40-ton limit. In short, it had to be superior to the Comet, while retaining the same mobility. The first step was creating a longer hull, with by the same set of long-travel five-wheel suspension, lengthened by a sixth pair. The original Christie suspension vertical spring coils sandwiched between side armor plates were replaced by a Hortsmann suspension. By nature, these were housed outside of the hull, allowing more internal space. So the entire roadwheel train was made of three bogies with two double-wheels each. The forward bogie set was further apart than the others. There were also six return rollers. The Hortsmann suspension, widely used before on the whole Vickers light tank series, had other advantages. They were easy to replace and to maintain, but they also procured a rougher ride. This time, contrary to the Comet where many elements were still bolted, the hull was entirely welded, with sloped front, sides and slightly less pronounced downslope at the rear. Drive sprockets were at the rear, near the engine, and idlers at the front. The tracks were made of a hundred and nine manganese steel links, each 24″ wide (60.7 cm). Total length with the gun was 29 ft (7.34 m) and 24 ft (6.1 m) hull alone. The cast turret extremely thick, featuring an impressive 152 mm (5.98 in) of armor on the mantlet. The sides were also well sloped, 38 mm (1.5 in) thick, but additional protection was provided by the large storage boxes on the mudguards, the drivetrain and suspension on the lower part of the hull. The lower/upper hull plates were 76 mm (2.99 in) strong, hull rear was 38 mm (1.5 in), the frontal hull deck was 29 mm (1.14 in) and the engine deck 14 mm (0.55 in), while the hull floor was 17 mm (0.67 in) thick. The armor thickness for the turret front (without mantlet) was 127 mm (5 in), roof 25 mm (0.98 in), sides and rear 76 mm (2.99) and the bottom was 38 mm (1.5 in). The turret was completely redesigned compared to the one on the Comet. It was partially cast, made roomier to accommodate a three-man crew and the latest development of the famed British 17 pounder. Another big difference was the 20 mm (0.79 in) Polsten cannon in an independent mount just on its left. The turret traverse was electric with a backup manual cranking wheel. The main gun had an elevation of 20 degrees and depression of 12. The turret ring size was 74″ (188 cm). Aiming was performed using No.43X3ML Mk2 optics. Provision for the main gun was 75 rounds, with an equal repartition of HE and AP shells. The turret itself was a hexagon, with sloped upper parts. The basket was long enough to accommodate extra ammo. Additional storage boxes were mounted on later versions until the turret was loaded with a makeshift protection made of spare parts, metal boxes, tools and haversacks. The original Mark 1 turret featured two extra rear storage boxes on the sides. On the top was located the commander cupola, rotatable with six long prismatic blocs of plexiglass. It was closed by a twin-part hatch and surrounded by a railguide for an extra AA machine gun. At its right was located the gunner’s hatch, also in two parts. An escape round hatch was also placed on the right side. Fasteners were welded on the front and two rear basket corners. To propel the expected 40 tons of this Cruiser, the Rolls Royce Meteor engine was chosen. It already equipped the Cromwell and Comet, was dependable and maintenance was easy due to the numbers of spare parts available and maintenance technicians already being familiarized with it. This version was the one produced by Rover-Tyseley (others were produced during the war by Meadows and Morris). It was derived from the world-famous Merlin engine which propelled the two best Allied fighters of the war, the Spitfire and the Mustang P-51. To be adapted as the Meteor, the V-12 27-liter engine was stripped of its supercharger, reduction gear and other equipment, making it more compact and simpler to produce. Other major changes were the cast pistons (instead of forged), rate output reduced to 600 bhp (447 kW, 23 bhp/ton power-to-weight ratio) and fed by lower-octane pool petrol instead of usual high-octane aviation fuel. Another point was the light alloys cast parts replaced by more common, cheaper ones due to less important weight constraints. These engines gave both reliability and the extra power required for the task, perfectly completing the A41 design. The transmission gearbox type was a Merrit-Brown Z.51.R with 5 forward and 2 reverse gears. – 5 with the new QF 77 mm (3.03 in) gun and a remote-operated hull machine gun for the driver. The final weight was eventually 42.5 short tons (38.55 metric tons), two and a half short tons above the required limit. The ground pressure was 11 kg/cm2. This was due to the realization that providing sufficient armor protection against a direct hit from a German 88 mm (3.46 in) within the weight limits, was proven quite impossible in the later development phase. These limits were tailored for the maximum load allowed by the standard Mark I/II transport trailers. When it was clear for the war Ministry that there was no way to meet these limits without serious performance sacrifices, a new transport trailer was devised and the limits raised. The final design incorporated a well-sloped armored glacis, 3 in (76 mm) thick. This was way better that the previous Cromwell and Comet, but still inferior to the 101-150 mm (3.98-5.9 in) of the Churchill, or even the 80 mm (3.15 in) of the Matilda II, a prewar design. But still, the effective thickness was much higher due to the high slope of the glacis plate. The pilots underwent long trials sessions before production, and the A41 was quickly recognized as better than the Comet, previous cruisers or any other British tank design so far, rendering obsolete a late-attempt to produce an interim design based on the Churchill, the A43 Black Prince. It was capable of replacing both the Churchill and the Cruiser tanks, and was probably the first successful attempt to produce a true “universal tank”. Only the pilots and a few production vehicles were produced until 1945. Three were sent for extensive trials near to the front in Belgium in March-April 1945, too late for any operations. The Mark 1 was considered highly successful, but in 1946 the Soviet tank threat forced the devising of an up-armored version, known as the Mark 2, which featured a frontal plate thickness increased to 110 mm (4.33 in) and 56 mm (2.2 in) thick sides. It also had a newly designed fully cast turret. This vehicle quickly replaced the Mark 1 on the production line, as 800 were ordered in November 1945 from Leyland Motors, Vickers (Elswick), the Royal Ordnance Factories at Leeds and Woolwich. 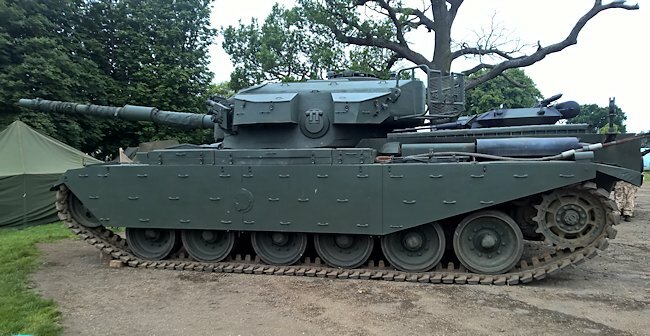 The Centurion II entered service in December 1946 with the 5th Royal Tank Regiment. After being replaced by the Mark 3, all Mark 1/2s were either converted as recovery vehicles or upgraded to the Mark 3 standard. This version introduced a brand new gun, the Ordnance QF 20 pounder (84 mm/3.3 in), providing far better accuracy due to a newly-developed fully automatic stabilization system. This allowed the gunner to fire on the move, as stated in prewar British doctrines, but rarely efficient. The rounds also were quite heavier and able to cope with the frontal protection of the T-34/85 and IS-2/IS-3. Little was known about the T-54 then. The second modification was the replacement of the Polsten 20 mm (0.79 in) by a much lighter standard 7.62 mm (0.3 in) Besa machine-gun. It was indeed shown that the Polsten was an unnecessarily large caliber to deal with regular infantry troops. There were also 2 stowage positions for the track links on the glacis. The Mark 3 was introduced in 1948 and production was higher than that of the Mark 2. They served in Korea extensively and proved somewhat more effective than the 90 mm (3.54 in) armed M26 Pershing and M46 Patton on the battlefield. The Mark 4 was an abandoned close-support version with a 95 mm (3.74 in) howitzer, but the concept was proven ineffectual and never tried again. The Mark 5 however, was a new league of the Centurion development. It introduced a more powerful version of the Meteor engine, a new gun sight and gun stabilizer. The Mark 5 also had Browning machine guns fitted to the coaxial and commander’s cupola mounts, and stowage bins fitted on the glacis. The Mark 5/1 (FV4011) introduced an increase in frontal glacis thickness and a twin-arrangement of coaxial machine guns, one .30 cal (7.62 mm) Browning and one heavy .50 cal (12.7 mm) with tracers, used for ranging for the 20 pounder main gun. The Mark 5/2 introduced the latest gun developed by the Royal Ordnance Factories. The famous L7 105 mm (4.13 in) gun. Outside of the caliber, this new rifled gun was much longer (L/52 or 52 calibers) and fitted with a bore evacuator. The breach had a horizontally-sliding breechblock. This L7 was first designed after tests performed against the T-54A, of which a single vehicle was captured on “British soil” -the British embassy in Budapest- driven there by its Hungarian crew during the revolution of 1956. The L7 became the staple of western main battle tanks gun, adopted by the upgraded US M60 and M1 Abrams, Germany’s Leopard, but also Japan, India, Israel and even China. It stayed in the first-line of the British inventory until the new L11 (120 mm/4.72 in rifled) was available. The versions which followed up until the production ceased, and even after for the British Army, were more basic upgrades like the Mark 6, former Mark 5s & Mark 5/1s upgraded with the L7 gun, then IR equipment and ranging gun. The Mark 7 (FV4007) had revised engine decks, was up-armored and up-gunned, the Mark 8 had a resilient mantlet and new commander cupola, while the Mark 9 (FV 4015) had IR equipment fitted and ranging gun, and the following Marks were upgraded with the same equipment. Some were mere prototypes, others were built in short series. -FV4004 Conway (1951): an interim project armed with a 120 mm (4.72 in) L1 gun Mk.3, finally dropped in favor of the Conqueror. –FV4005 Stage I and 2 (1951-55): an experimental tank-destroyer fitted with the Ordnance L4 183 mm (7.2 in) gun. The Stage I had an open turret, while the second was enclosed. Only one prototype of each was ever built. -FV3802 (1954) & FV 3805 (1956): prototype SPGs, with 25 pdr or 5.5 in (139.7 mm) guns. The first was accepted in 1954, but the next FV 3805 was preferred and itself was dropped in favor of the FV 433 105 mm (4.13 in) SP Abbot. -FV4006 Centurion ARV Mk. 2 (1956): It was derived from Mk.I/II/III turretless vehicles fitted without (Mk.I) of with (Mk.II) a fixed superstructure housing a 90-ton lifting capacity winch. -FV4003 Centurion Mk 5 AVRE 165 (1963): designed for the Royal engineers, equipped with a 165 mm (6.5 in) demolition gun, a hydraulically operated dozer blade or a mine plough, could carry either fascine bundles, a metal trackway or tow the Viper mine-clearance system. This jack-of-all-trades was still in service in 1991. Other sub-types included the AVRE 105 (Combat Engineer Version armed with a 105 mm/4.13 in gun) and the AVRE 165 (165 mm/6.5 in L9A1). -FV4016 Centurion ARK (1963): Mark 5-based Armored Ramp Carrier, with a 75 feet (23 m) span, and could bear 80 tons of load. -FV4019 Centurion Mk 5 Bulldozer (1961): used the same kit as the standard AVRE. They equipped every squadron. -FV4002 Centurion Bridgelayer: the standard model equipped with the Type 80 folding bridge. The AVLB was a Dutch-adapted version. -FV4008 Duplex Drive Amphibious Landing Kit: This system consisted of twelve lightweight panels forming a jettisonable skirt and fixed floatable deck around the Centurion. –FV4018 Centurion BARV (1963): Beach Armored Recovery Vehicle, used by the Royal Marines until 2003. -“Low Profile” Centurion: fitted with a Teledyne low-profile turret (prototype). -MMWR Target: a late conversion for radar targeting exercises, possibly still in service. -Marksman: fitted with a Marksman air defense turret (prototype). Australia and Canada both received their Centurions early on. The Australian ones saw heavy fighting in Vietnam, while the Canadians saw early action in Korea in the 1950s. Former Canadian Centurions were sold to Israel and are still in service, converted. New Zealand also acquired twelve of them, now retired. Netherlands, Switzerland, Denmark and Austria all acquired Cents. Most of this export success was attributed to the laurels gained in Korea. All replaced them in the eighties-nineties with Leopard I/II tanks. Former Austrian Centurions are now fixed blockhouses. In 1953, the Royal Swedish army purchased 80 Mk. 3s (20 pdr) and in 1955, 160 Mk. 5s. However, their instrumentation had to be changed into the metric system and they swapped their original radios for Swedish ones. Since these vehicles pre-dated NATO standardization, they had to be made compliant later. These vehicles were called Stridsvagn 81. Another batch of 110 Mark 10s purchased in 1958 with the new L7, called Stridsvagn 101, also converted to NATO standards. By the 1960s, these vehicles were gradually updated to the Stridsvagn 102 (former Stvg 81s) and Strisdvagn 101R standards. The former was upgraded with the REMO system. Other upgrades (Strisvagn 102R and 104) consisted of armor increase and Sho’t Kal Alef motorization. The 105 and 106 were prototypes. Earlier models were also converted into Bärgningsbandvagn 81 (Swedish ARV). 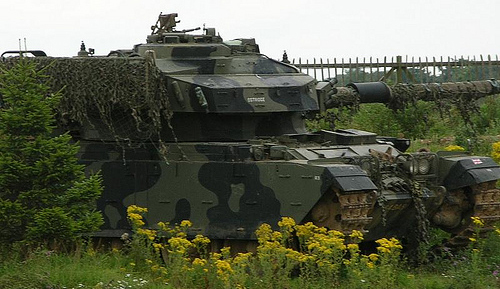 These have been replaced by the local version of the Leopard 2, known as the Stridsvagn 122. Egypt acquired some, but replaced them later with Soviet and US models. They saw combat in the 1967 war, against Israeli Centurions. Iraq also purchased some vehicles, but they were in reserve or deactivated before the First Gulf War (1991) and apparently never saw action against Iran in the 1980s. Jordan also acquired some vehicles, their chassis later re-used for the Temsah APC. Kuwait and Lebanon also used the Centurion for years. They are also now retired. The IDF owns a great deal to these vehicles, and adapted them as the Sho’t. They are now retired but played a crucial part of the nation’s early survival wars. Many hulls were converted to the Nagmachon/Nagmashot heavy APCs, Nakpadon ARVs and Puma CEVs. South Africa is the longest time user of this vehicle. South African Centurions were converted to a highly modernized version, with the help of IDF engineers and modernization kits. This became the Olifant, still in service today. Somalia also used some Cents (later used by Somaliland rebels) and for some time the Libyan Free Army fielded a Centurion AVRE 105 mm (4.13 in) from Jordan. 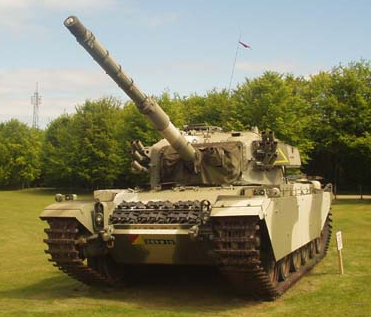 India also acquired Centurions Mk.7 (L7 gun), later replaced by the Vickers Mk.II. They saw intensive action during the Pakistani war of 1965. Singapore purchased sixty-three Centurion Mk. 3 and Mk. 7 from India in 1975, followed by others ex-Israeli Sho’t tanks in 1993. All have been upgraded to the latest IDF standards, under the name of “Tempest”, with a new main gun, diesel engines, and possibly reactive armor. Now retired from first-line service, they have just been replaced by Leopard 2SGs. The Israeli Army took the best the Centurion had to offer. The first purchase of Centurions Mk. 5, in the early sixties, arrived right in time to help improve an army which was until then equipped mostly with Sherman tanks and light French AMX-13s among other types. The Centurion was the IDF’s first and main battle tank for years, as it became legendary in 1967 and saw extensive modernization campaigns. The biggest change for the local Sho’t (Hebrew for “scourge” or “whip”), was the Continental AVDS-1790-2A diesel engine coupled with the Allison CD850-6 transmission (1970). The Sho’t Kal upgrade (1974) saw the introduction of Mk. 13 armor and pintle mount 0.50 cal (12.7 mm) HMG. 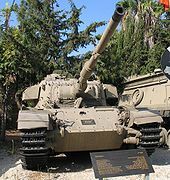 The Kal Alef, Bet, Gimel and Dalet were upgrades for the turret rotating mechanism, gun stabilizer, fire-control system and ultimately a new ERA composite armor (Dalet). Now retired or sold, their chassis are still in use through conversions. Probably the most far-reaching modernization of the venerable Centurion today. Initial orders were placed in the 1950s and additional vehicles were purchased later from Jordan and India. Due to ONU’s later trade embargo, the SAF government sought to modernize its existing machines. The IDF helped to create the Semel in 1974, a re-engineered version with an 810 hp fuel injection petrol model and semi-automatic transmission. It was followed by the Olifant Mk.I (1978), with a 750 hp diesel engine and semi-automatic transmission, then the Mk.IA (1985), with a laser rangefinder and image-intensifier. 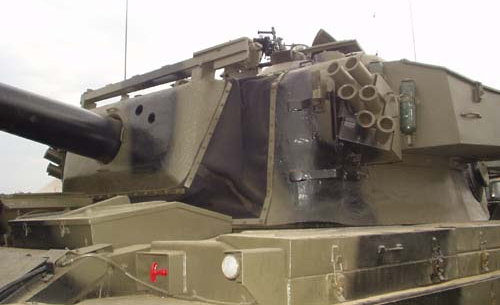 But the Olifant Mk.IB (1991) was a new league with completely new armor, hull, suspension, a V-12 950 hp diesel engine, a computerized fire control system and new laser rangefinder. The Mk.II is even more radical with a new turret, new fire control system and features a rifled 105 mm (4.13 in) GT-8 or a 120 mm (4.72 in) smooth bore main gun. They are still frontline today. British Centurions from the Commonwealth divisions operated with certainly the best results of all allied AFVs present on the battlefield. 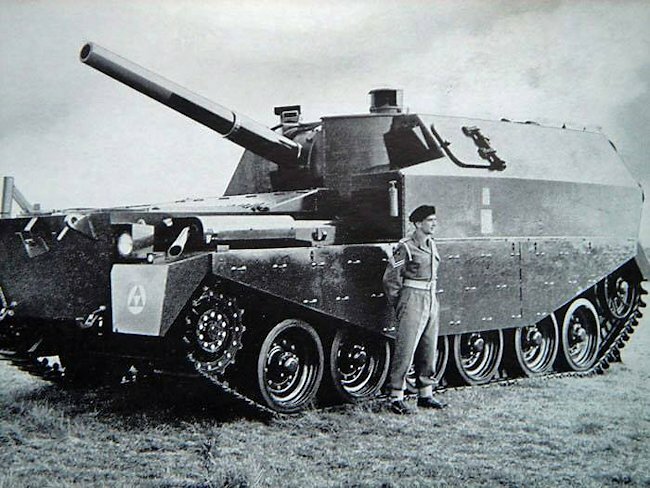 Their 20-pdr could destroy any long-range targets with pinpoint accuracy. This started with the involvement of the British Army’s 8th King’s Royal Irish Hussars which landed at Pusan, on 14 November 1950, followed by other units. Engagements included the Battle of the Imjin River in 1951 and the second Battle of the Hook in 1953. Their success led Allied CIC General John O’Daniel, to official praise the mobility of the Centurion fielded by the 8th Hussars in joint operations. They proved vastly superior to the Chinese or NK T-34/85s. 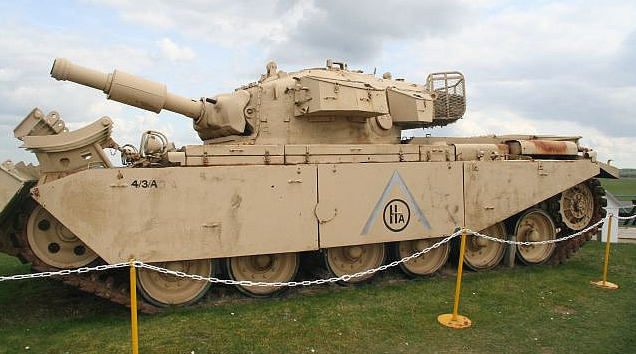 British Centurion were deployed with some limitations due to high command’s initial hesitations on how to combine in the right proportions sea, air and land power projections. However General Hugh Stockwell firmly supported the idea of methodical and systematic armored operations served by the Centurion to gain a quick victory. The Royal Marines landed at Port Said on 5-6 November as well as the 6th Royal Tank Regiment, facing T-34s and SU-100s, quickly gaining the upper hand, with no losses. Four Indian Armored Regiments were equipped with the Centurion in 1965. At the Battles of Assal Uttar, Khem Karan, Phillora, Chawinda and others they proved superior to Pakistani M47 Pattons. Most of the Indian 32 losses at Assal Uttar alone were M4 Shermans while the Pakistanis lost nearly 70 Pattons. India’s Centurions were also committed to the liberation of Bangladesh (War of 1971). 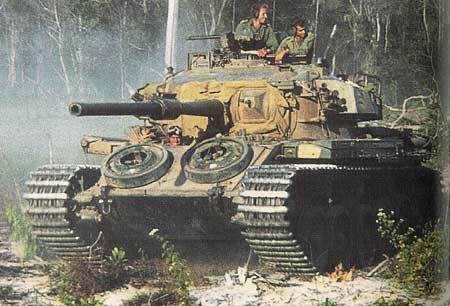 By the time the Six-Day War began, the IDF fielded 293 Centurions out of a total of 385 tanks. Their outstanding success was due to tactics, training and some luck, but they managed to destroy large numbers of enemy tanks and even some enemy Centurions, while managing to capture 30 of the 44 fielded by Jordan. But their fame really came during the battle of “The Valley of Tears” (Golan Heights, 1973 Yom Kippur War). Outnumbered one to five, they nevertheless managed to wipe out or repel the bulk of the Syrian army made of five hundred T-54/55 and T-62s. Modernized Sho’t tanks were also heavily engaged in the 1982 invasion of Lebanon. The actual Merkava MBT took a great deal on the Sho’t improvements and the Centurion itself. Australia fielded Centurions with the 1st Armored Regiment (1949), based at Puckapunyal, Victoria. They replaced aging Churchills in 1952. They began their engagement with the 1st Australian Task Force (1ATF) arrived in 1967 at Nui Dat (Phuoc Tuy province). The first tank unit, C Squadron, arrived in February 1968, equipped with eight tanks, two dozer and two bridgelayer versions. Until August the squadron was reinforced until it reached a strength of 20 tanks, with some modifications. Until 1971 they had been heavily engaged, described by the troops and officers alike to be “worth their weight in gold”. It should be noted that a single Mk. 3 was tested in the 1953 nuclear test, now preserved at the Robertson Barracks in Palmerston as the “atomic tank”. SAF ground forces involved their newly-modernized Olifants, in various variants, in this protracted, 26 year conflict, although South Africa disengaged in 1989. Their most severe engagement came with the Battle of Cuito Cuanavale in 1988, against Cuban supported MPLA’s forces, largely equipped with Soviet tanks. British forces operated Centurion variants, first in Operation Motorman in Ireland 1972, when 165 mm (6.5 in) AVREs equipped with dozer blades destroyed barricades set up by the IRA. Second, in the Falklands War, a single BARV was operated. Third, a single unit of British AVRE’s was deployed during Operation Desert Storm (1991). Crew 4 (commander, driver, gunner, loader). FV 4401 prototype, testing in Germany, April 1945. Centurion Mark 2, 5th Royal Tank Regiment, without side skirts, 1947. Centurion Mk. 3 “Arromanches”, 3rd Squadron, 1st Royal Tank Regiment, Commonwealth Division, Korea, 1953. Mark 3 “Abbot’s pride” from the 8th King’s Irish Hussars in support of the 29th Infantry Brigade, Korea 1951. Mk.3 from the C squadron, 5th Royal Dragoon Guards, Commonwealth division, winter 1951-52, Korea. Israeli Mk.3, Six-Day War, 1967. 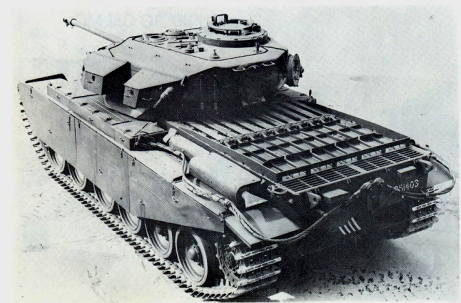 Mk.3, from the Royal Jordanian Armored corps, Six-Day war, 1967. Other actions included the 1970 Syrian incursion and 1973 Yom Kippur war. Centurion Mk.3, unknown unit stationed in the UK, camouflaged in the regular NATO colors, late 1950s. Centurion Mk. 5, unknown unit stationed in the UK, in maneuvers, 1960. Camouflaged Mark 5 from the Royal Guards Hussars, early 1960s. 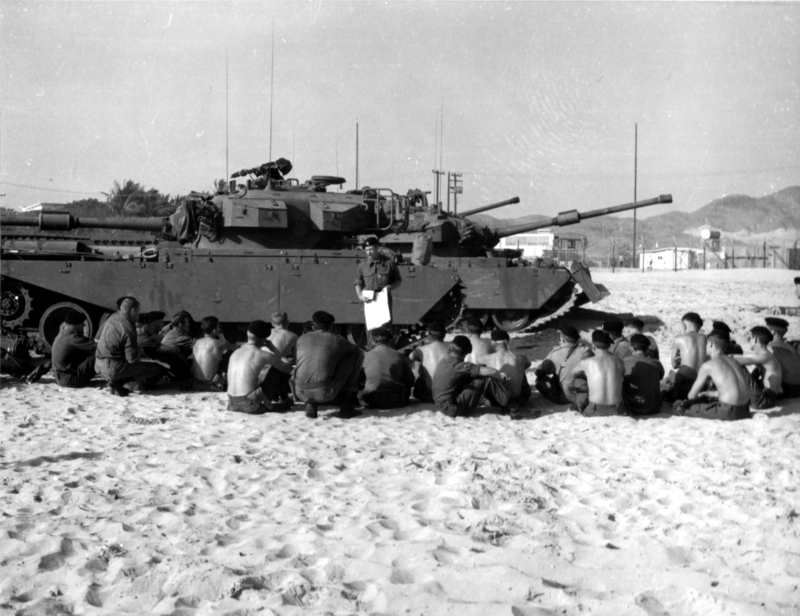 Australian Mark V in Vietnam, 1968. Mark 5 based Israeli Sho\’t, Yom Kippur War, 1973. Mark 5-1, 8th Canadian Hussars (Princess Louise\’s) Exercise Holdfast, Northern Germany, September 1960. Canadian Mark 5-2, Lord Strathcona\’s Horses (Royal Canadians), Soltau, West Germany, September 1966. Centurion Mark 6, unknown unit, England, 1970. IDF Sho’t Kal from the second company, third batallion, Lebanon, 1982. The 12.7 mm (0.5 in) and two 7.62 mm (0.3 in) machine guns provided extra firepower in urban warfare. 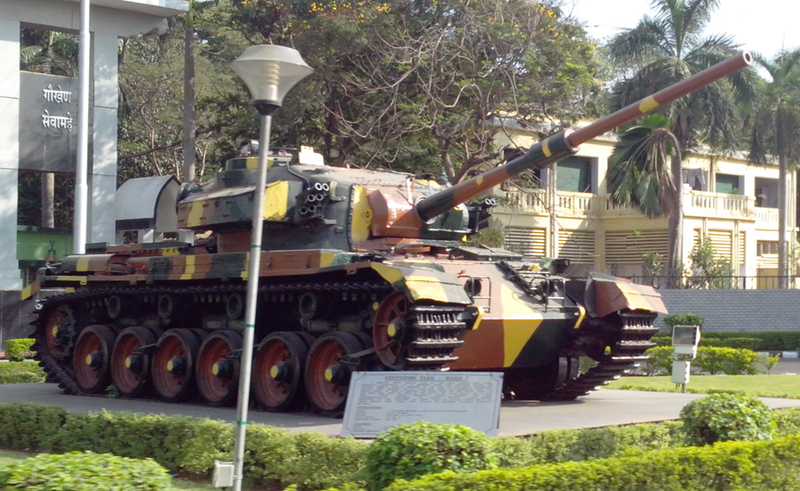 Indian Centurion Mark 7, left from the 1971 war with Pakistan, now at the Officers Training Academy at Chennai. This tank was apparently repainted recently with a three-tone livery. Mark 7 with a “what if” urban camouflage. There is no evidence any was painted this way. Canadian Centurion Mark 8, with the three-tone camo of the 1970s. 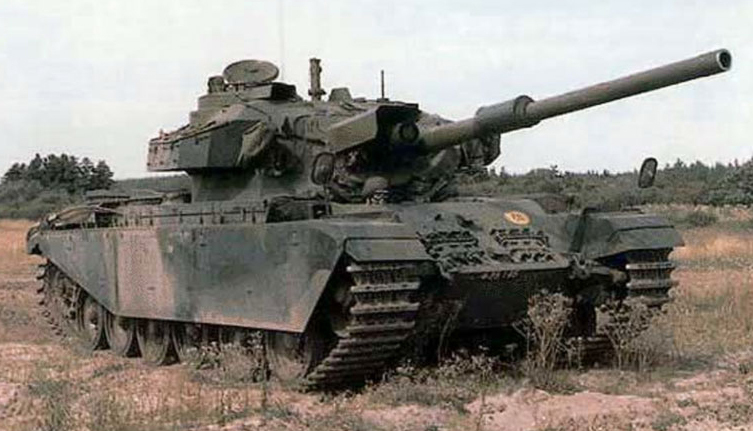 British Centurion Mark 10, 1970s. Dutch Centurion Mk. 5-2 upgraded to the Mk. 11 standard from the Huzaren Prins van Oranje unit. 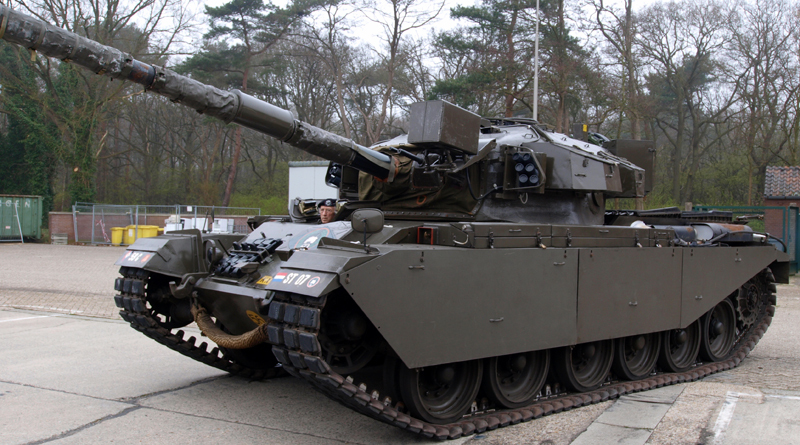 British Centurion Mark 13, without thermal sleeve, but with a Chieftain cupola and LMPG. SADF Olifant Mark IA main battle tank, 1985. Specifications incorrectly state that the tank was armed with an L11 120mm. You fixed the 120mm gun but it seems the specifications are still incorrect. It doesn’t use a British Leyland diesel, it’s armor scheme isn’t 195/120/35 mm, it’s speed/range isn’t 48 km/h for 500km and its dimensions are not (10.79m (7.51m) x 3.5m x 2.89m). They are (120mm gun included) however the correct specifications for the Chieftain tank, I suspect someone made a mistake when creating the article. You should probably just redue this specification box from scratch. why are the gun muzzles on the 17pdrs on the mk 1 and 2 different to the normal roundish shape? were they actually like that? A family member of mine, now retired, served for the royal 8th hussars C Squadron mostly in the 1960’s. At that point they kept the 20pdr gun on even their latest tanks rather than the updated L7 105mm. He was given the only MK.3 Centurion left in the regiment, replacing the BESA machine gun with a Browning but not including the rotational floorboard of a MK.5. It housed 2, able to have 3, radios as it was a Commander’s MK.3. Accordingly the 20pdr shells felt a lot heavier than 20 pounds, 20 pounds being the weight more accurately of the HE/T rounds initially fired. They only engaged tanks up to 2000 yards, infantry up to 5000 yards, and were somewhat immune to Russian 100/122mm cannons over 800 yards. You mention Royal Marines @ Suez but I believe 2Para also came ashore with them.Elements of 1/3 Para were dropped onto and took the airfield. May 1944. Didn’t even start until July 1943. 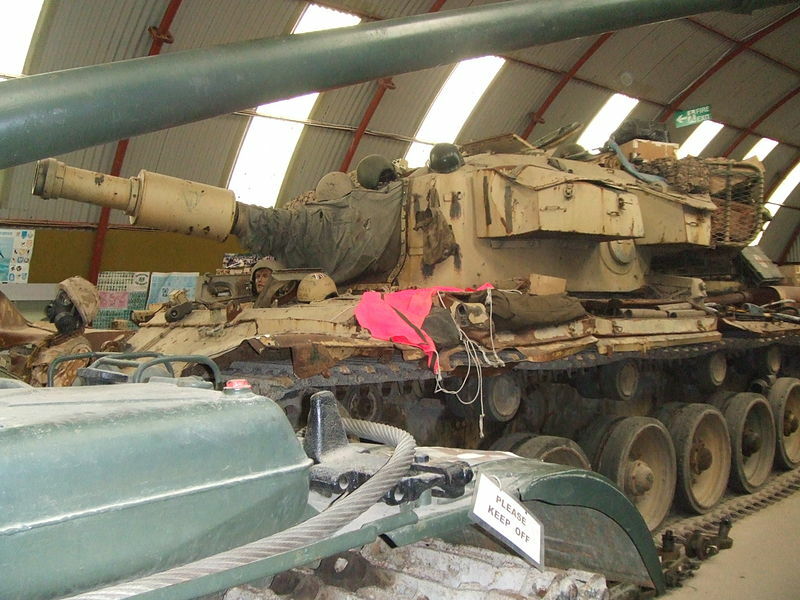 Does anyone have definitive date when the Centurion was withdrawn from frontline service as a battle tank (as opposed to Engineer’s versions)? I was in Germany attached to the 13/18 Royal Hussars as a REME Cfn in A Sqn LAD in 1961-64. I believe there was a MK14 with infrared gun sighting at the end of the Centurion run. 5th RTR were test running a Chieftain chassis next door in 64. During the 1965 Indo-Pak War, were the Centurion MK VII’s used by the Indian armored brigades armed with a 20 pdr. or the newer L7 105mm guns? I’ve found conflicting sources. Some say one and some say the other.